Many heating and cooling problems can result from a faulty thermostat. When it’s time to replace your current thermostat, our professional technicians are ready to answer questions you may have about choosing the right type of thermostat for your home’s heating and cooling system. Thermostat not working? Let us replace it! Thermostats have come a long way in the last couple of decades. So if your home or office thermostat needs to be replaced, contact us at LIBERTYAIR. We can help you choose a thermostat that will meet your air conditioner and heater needs along with finding what will work best for your home. Many thermostats now come equipped with energy saving programs and a lot of added convenience, so give us a call and find out how heating and cooling your home can be easier than ever before. 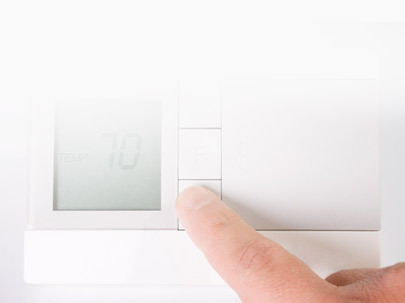 Non­programmable thermostats are the most basic types of climate control for any home or office. These types of thermostats usually allow you to change the temperature, choose between the heating and cooling settings, and turn on/off the fan. Many non­programmable thermostats offer digital, lighted displays, however, some of the oldest models are still around. The older models display a range of numbers with a dial or needle that points to the current room temperature. Thermostats that are not digital may not be as accurate as the newer, digital models. Programmable thermostats offer all of the basic features of a non­programmable thermostat along with some additional features that can add a lot of control and convenience to heating and cooling your home. These types of thermostats are available from several different manufacturers, but many of them offer similar functions that allow you set timers on heating and cooling. This can come in handy if you want to participate in energy saving practices, such as allowing your home to be warmer during the day in the summer and cooler in the evenings. Just a few degrees can make a big difference, but with busy schedules, staying on top of changing the thermostat twice a day can be impossible. Programmable thermostats allow you to determine what time of day, and even which day of the week, you want the temperature to change. Some of the more advanced programmable thermostats even allow you to create custom heating and cooling programs for individual rooms. As touch screen technology spreads to nearly all aspects of our lives, it’s no surprise that manufacturers now offer touch screen thermostats. These thermostats generally have a larger interface screen with limited (or zero!) buttons. The touch screen feature can be most commonly found on programmable thermostats, so you still get plenty of scheduling and energy­saving options. When you need total control of your home’s heating and cooling from a distance, wireless thermostats may cost more, but they’re offer much more convenience. With a wireless thermostat, you can access your heating and cooling system remotely, allowing you to take the energy savings and total in­home comfort one step further. In addition to the timers and schedule options available, you can take manual control of the thermostat, which means you can turn up the heat before you get home or cool off your home on the drive home from the beach. Choosing a new thermostat should not be done lightly. When your current thermostat stops working properly, you have the opportunity to evaluate your heating and cooling needs and decide whether your thermostat actually met those needs. At LIBERTYAIR, our thermostat replacement technicians can help you determine which thermostat will suit the needs of your heating and cooling system as well as the needs of your family.